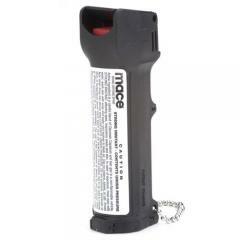 The Mace Triple Action Police is a law enforcement-grade personal defense spray intended for effective defensive application in high-pressure scenarios. It contains a mixture of high-strength capsaicinoids and CN tear gas, allowing it to simultaneously disorient, blind and choke the target, with enough formula for 10 one-second bursts. It is effective at up to 12 feet, with a stream dispersal pattern that reduces cross-contamination and makes it more effective in windy conditions. It also includes an ultraviolet dye that makes it easier for police to identify the right suspect. It comes with a flip-top safety cap to prevent accidental discharge, as well as a key chain and belt clip for portability. Excellent primary defensive item. More often than not, this may be just what is needed to end a serious event, without resorting to deadly force. Effective non lethal defense, hope never to need it.